It was with great pleasure and honor that I delivered remarks last night at the Fourteenth Annual Justice Robert Benham Community Service Awards. These awards honor Georgia Bar members who have selflessly given their time and commitment to make their individual communities better places. They were created and named after one of my heroes, the Honorable Justice Robert Benham. Below are my remarks. It is my distinct and honor and privilege to welcome you to the 14th Annual Justice Robert Benham Awards for Community Service. This year’s worthy recipients, and countless other Georgia lawyers who volunteer their time and expertise in their communities, bring great honor to our profession. It is our privilege to honor them tonight. These awards recognize the commitment of Georgia lawyers to volunteerism, encourage all lawyers to become involved in community service, improve the quality of life of those they help and even enrichen the lawyers’ own lives through the satisfaction they derive from helping others. Their work also raises the public image of lawyers. Tonight is one of the highlights of my year as President of the State Bar, as I am sandwiched between Chief Justice Carol Hunstein, who, as she well knows, is one of my heros and Justice Robert Benham, who is another hero and legendary role model. Since these awards are given in the name of our dear Supreme Court Justice Robert Benham, it is only fitting that we take a moment to reflect on the example of service Justice Benham is for us through his extraordinary life. Justice Benham distinguished himself as the first African American to win statewide election in Georgia since Reconstruction. 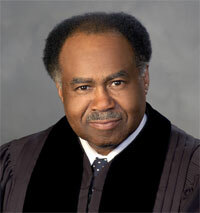 In 1989, Justice Benham was further distinguished as the first African American to serve on the Supreme Court of Georgia, following his appointment by Governor Harris. He also made history both as the first African-American to establish a law practice in his hometown of Cartersville. In what can only be described as something straight out of a movie, when Justice Benham would walk down the street in Cartersville to go to the Bartow Co. Courthouse, many fellow African Americans would come out of their homes and out of their places of work to follow him down the street. The shouts of “Mr. Benham’s going to court, Mr. Benham’s going to court” could be heard as they followed their hero, then “Attorney Benham”, to the courthouse, because they knew Attorney Benham was going there to stand up for the little guy, the underdog. Justice Benham’s first lesson of service to others probably came at the hands of his mother, who insisted that he shine shoes at the local barber shop. Quite a lesson that Justice Benham never forgot. Years later, Dr. Martin Luther King, Jr. would say that life’s most persistent question is “What are you doing for others.” Life’s most persistent question has been the hallmark of Justice Benham’s life. And tonight we honor these lawyers for their commitment to service to others. One of the hallmarks of the profession is law is a recognition that along with the privilege to practice law comes a duty to subordinate financial reward to social responsibility. Tonight’s award recipients have demonstrated their understanding of this and with their public service to their communities have embodied Justice Benham’s example of service. Through this work they are promoting the cause of justice, upholding the rule of law and protecting the rights of all citizens. Congratulations to our award recipients tonight on behalf of the State Bar of Georgia. May God bless you and your families and may God Bless the Great State of Georgia.